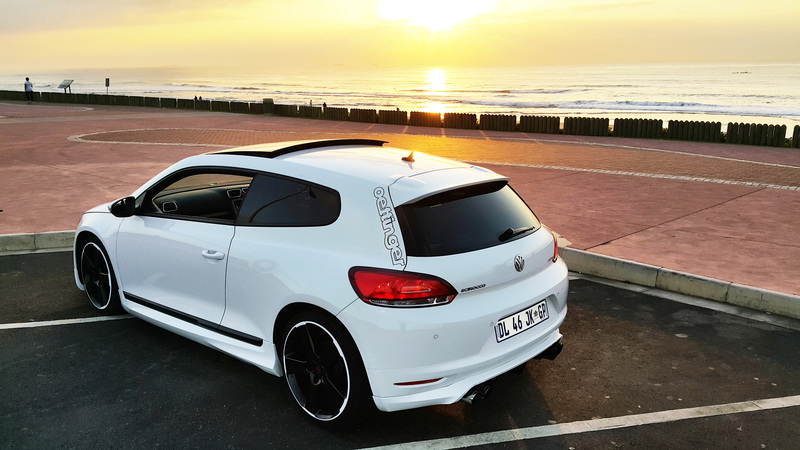 We drive the Oettinger Spec VW Scirocco 2.0 TSI DSG with 188 KW to Durban and Back. Amazing performance, in a very tight package! Those of you that read our blog on the Golf R400 Oettinger will know that I am slowly but surely drawing myself deep in to the world of VW. This is the company that owns some of the greatest automotive brands of all time, built itself up after years of re-building in Germany and has managed now to become a true South African favourite! With thousands of VW Polo`s on the road, the new VW UP being launched and the brand new Toureg, what we have found at SA Buyers Guide, is that unlike fans of most other popular brands in SA, the VW fans in SA are very engaged with the brand, and every time I drive into any petrol station at night, there is bound to be a GTI or now, Golf 7 R somewhere in the parking lot. So, we know the GTI! We are starting to see the 7R and 6R much more now on the road – with a few of our close friends choosing this over other BMW performance cars. 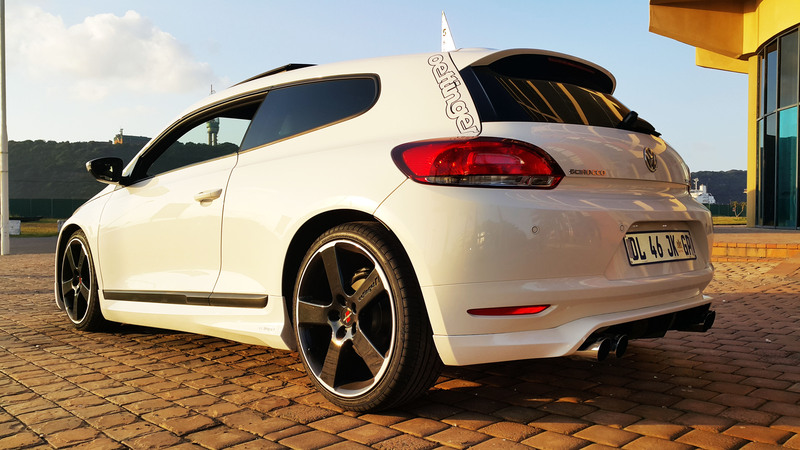 When Lindsay Saker Edenvale, asked us to test the 188 KW Oettinger spec Scirocco, our interest was truly peaked! We love good looking cars. We love cars that are safe. We also love cars that go fast enough, to get your blood racing just a little bit. I found that wonderful combination in this car. All 3 of those great elements combined! The Oettinger body kit, adds a lot of presence to what already is a very muscular car. 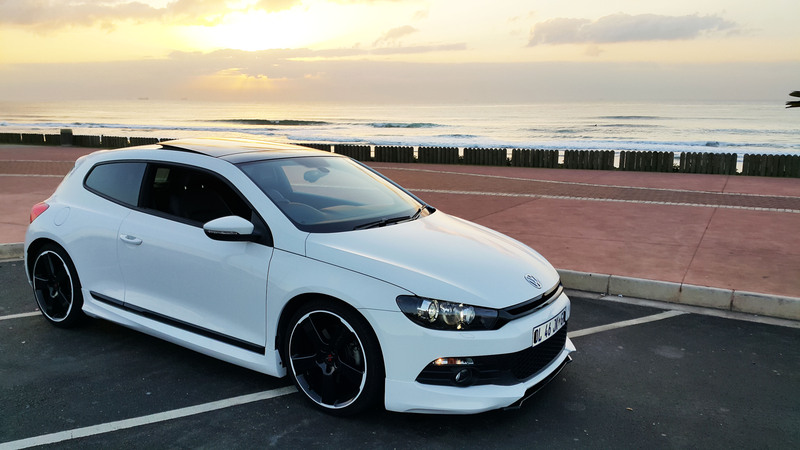 The design of the Scirocco hasn’t always attracted much attention, however, with the modifications made to this model it truly was amazing. This weekend away involved a trip back home to Sydenham in Durban. The area is next to Overport, and if you know the place, there is about 1 VW GTI to every other 5th car, and about 2 to 5 of those being Polo. The VW brand is firmly entrenched in Durban. Every time we drove around, 2 – 3 people would come up to the car and ask about Oettinger. 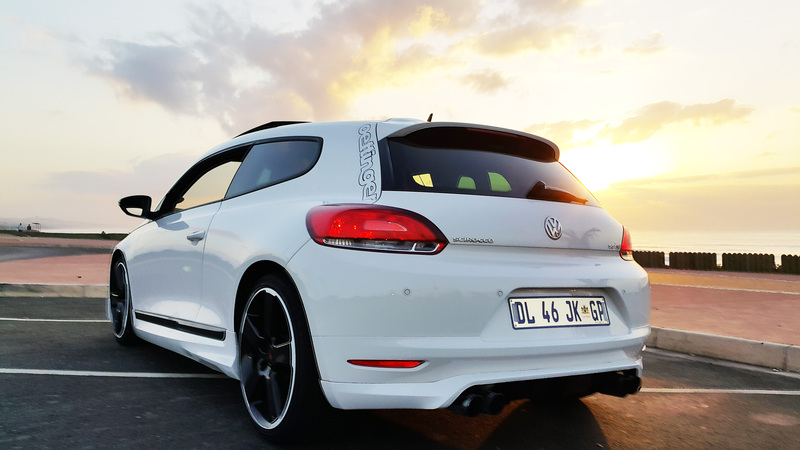 At the Umgeni Road Engen, I chatted to 2 guys who had just come back from a day at Dezzi raceway, and they told me this Oettinger kit was the best they had ever seen on a Scirocco. I fully agree! 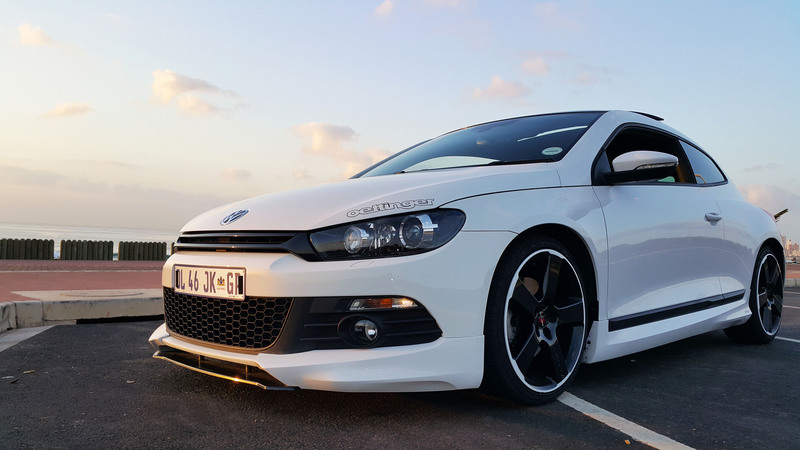 The body kit takes me back to my days in Matric, driving home after my Matric dance in a VW VR6 ( bottle green with very extra available). That kind of feeling doesn’t come often, but I really did love the stance of the VR6. On the build quality side – every single time I closed the boot of this car, it made a huge thud noise. That kind of quality is very rarely seen in modern cars. I felt secure thanks to its great design! The interior is very easy to live with. The seats are a bit harder than my BMW, but when I think of the purpose of this car, and what it is meant for, it is easy to imagine someone that is Single, may have a partner, and not kids. The reason I say this is, it is a 2 door car, and I can`t imagine someone with a car seat getting in and out of this car, without immediately swopping it for an Oettinger Tiguan model. The interior and dash are neatly laid out. After 2 days I became accustomed to the heated seats. The dash and steering wheel layout, has been very ergonomically design, so the functions are easy to manage, even for someone not accustomed to the VW system. The seats even have Oettinger stitched into the Head rests, which I really liked. Other than that, most of the interior of this car was standard for the Scirocco. My phone connected quickly to the Bluetooth system, without any fuss, once it was set connecting was a breeze. The seat on the driver`s side, is electrically adjustable, even with a button to support the small of your back. With winter approaching, we kept the heated seats on 1 light, and I actually used the small support for my back, because I think I am getting old! Even if you have 2 passengers, there is still enough legroom for 2 average size adults. If you are single, but have a kid, she or he would be more than happy to be in this car! Here the engine has been uprated thanks to Oettinger from the standard 155 KW to 188 KW, which is exactly the same as the R version of this model. The sound, the performance and actual transfer of power in this machine, is phenomenal! The true test of any car, is on the open road, and for longer distances. On the 584 kms from my Durban home to Johannesburg, the VW hummed away very patiently at 120 KM/hr. On the deserted back roads in Durban – it gets up to 160 kms/hr very very quickly! Even with the aircon on full blast, and some random Britney Spears nonsense playing on East Coast Radio, the car keeps its power delivery consistent without any lag. If I could write a sonnet to this poem, I would. We are working on bring you video reviews on these cars – the more friends you share this blog with, the quicker that will happen. For a performance car, my average was 8.9 L/100 kms coming up ( 120 Km/hr average with aircon), and going down only 6.5 l / 100 kms ( 100 kms/hr average no aircon thanks to the cold weather) – while escorting our old tazz back home. This car has go kart like handling. You need to phone Fabio to arrange a test drive. Reading about this on our blog, is not enough. The car sticks to the road, thanks to its great centre of gravity, the steering is direct and a little lighter than my BMW, but actually makes every day use a breeze. Entering and exiting a corner in this car, is better than any VW I have ever driven. The huge 18 inch rims, and its low centre of gravity, keep this little monster on track. But driving it yourself, will confirm what we write here. Any fast car, needs to be Safe – Euro NCAP rates it at 5. We have a friend who hit a huge water patch in December, in a 1.4 version of the same car, it slid and collided with a barrier. All the airbags deployed, and he was back at work in 2 days. So yes, very very safe. 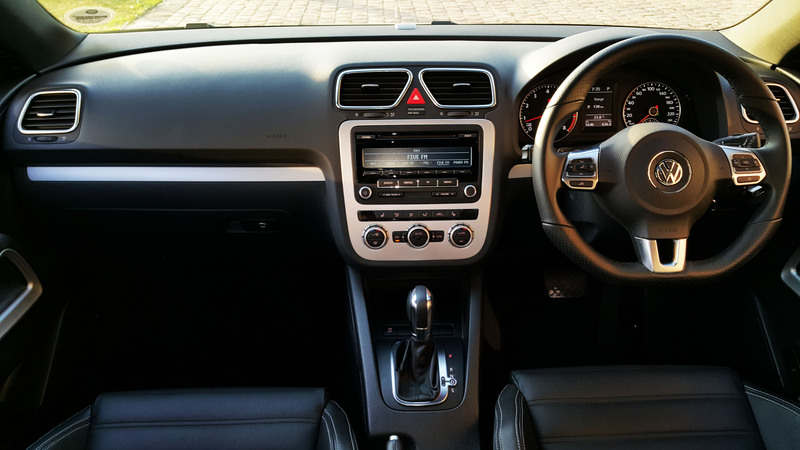 When you sit inside the Scirocco, you would be forgiven for thinking you are a pilot, it truly has a “cockpit” type feel. If you are considering any performance car, try this first before you buy anything. Especially at that price point. We will test an Oettinger GTI soon, so keep watching this space! This entry was posted in Car Review, Car Test. 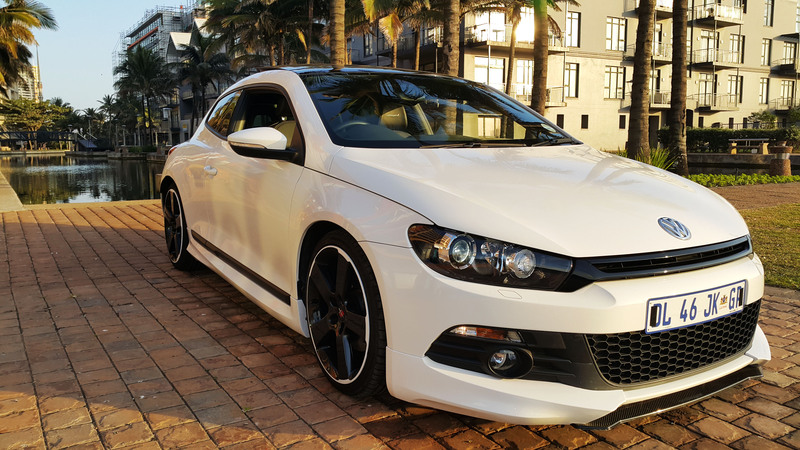 Tagged 188KW Oettinger Scirocco, Lindsay Saker Edenvale, Oettinger, Oettinger GMBH, Oettinger SA, Scirocco, VW Lindsay Saker, VW Scirocco, VW Scrirocco 2.0 TSI DSG 188 KW.